Nothing beats homemade gifts, right? 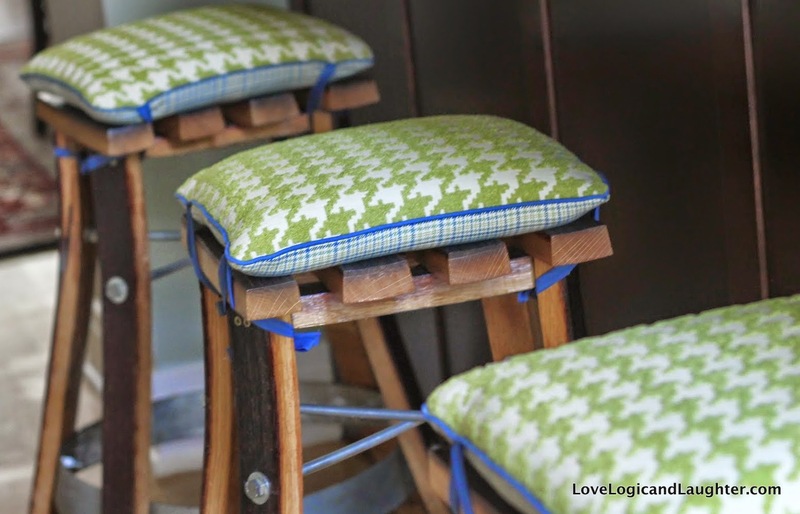 Because for my sister Nicola's birthday, my other sister and I tag teamed to make her cushions for her kitchen bar stools. 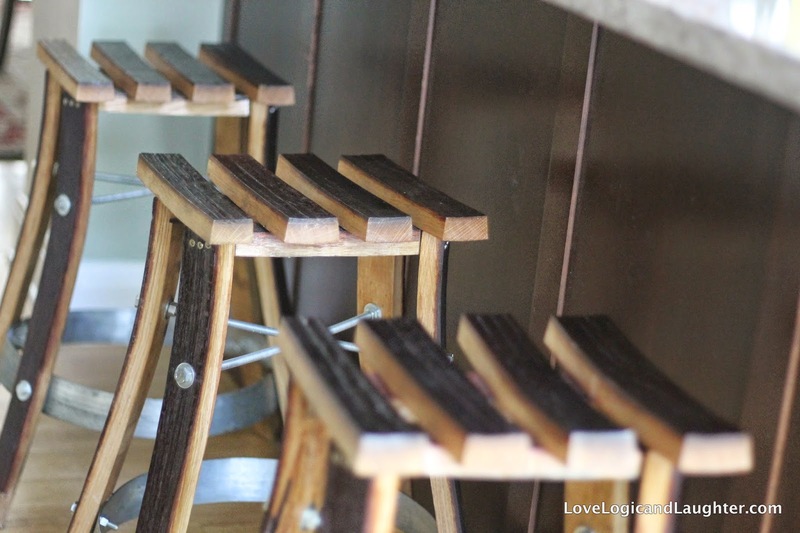 My sister Nicola, has 3 incredibly awesome bar stools at her kitchen peninsula. 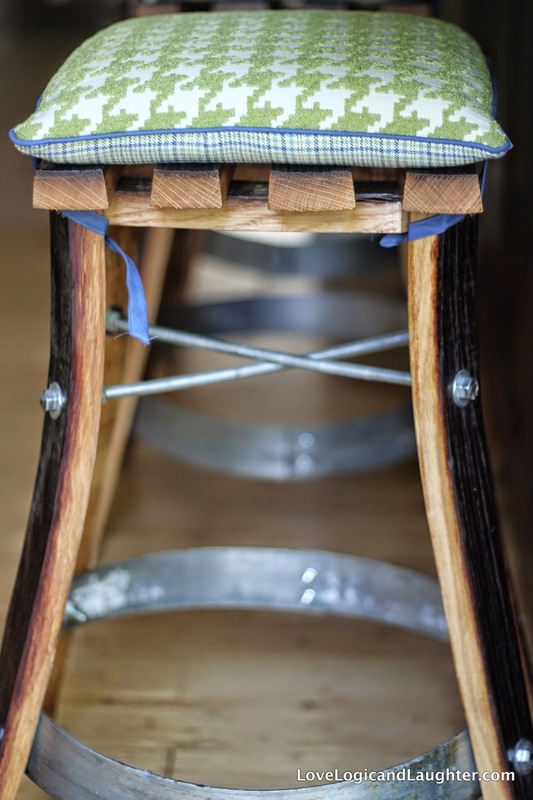 They are made from wine barrels and are one of a kind. They get a 10/10 for looks, however they get a pretty low score when it comes to comfort... Up until now, when we would visit her and congregate in the kitchen (because she is an AMAZING cook - check out her food blog) we would go get a pillow off the couch in the adjoining room, place it on the stool and then make ourselves comfortable at her kitchen counter. So hopefully after the addition of these cushions, people can keep Nicola company comfortably and watch in awe as she whips up delicious meals. Lauren (the other sister who helped make the gifts) helped by choosing the fabrics and babysitting Eliana while I sewed. Good teamwork, right?! 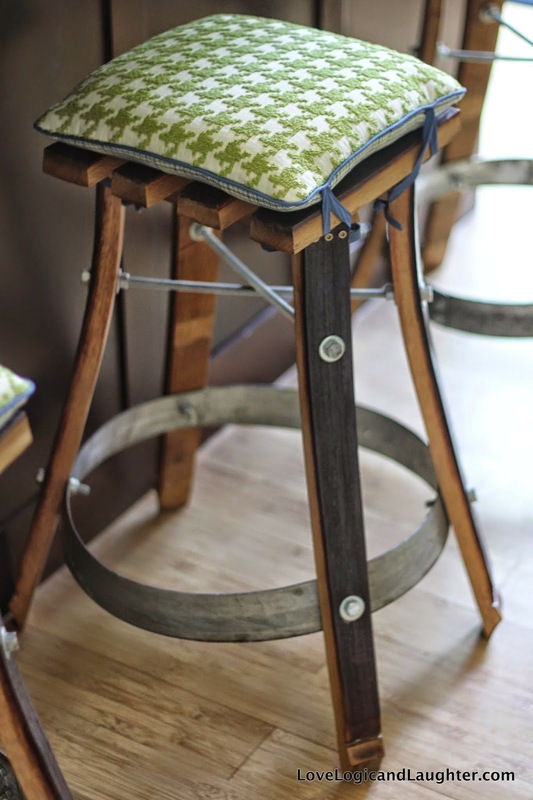 The fabrics are fun and coordinate well together so that you can tie them onto the stools with the green side up or the plaid side up. And, Oops! If you spill something on them while eating... then just flip it over! Or, if needed, unzip the cover and throw it in the wash! 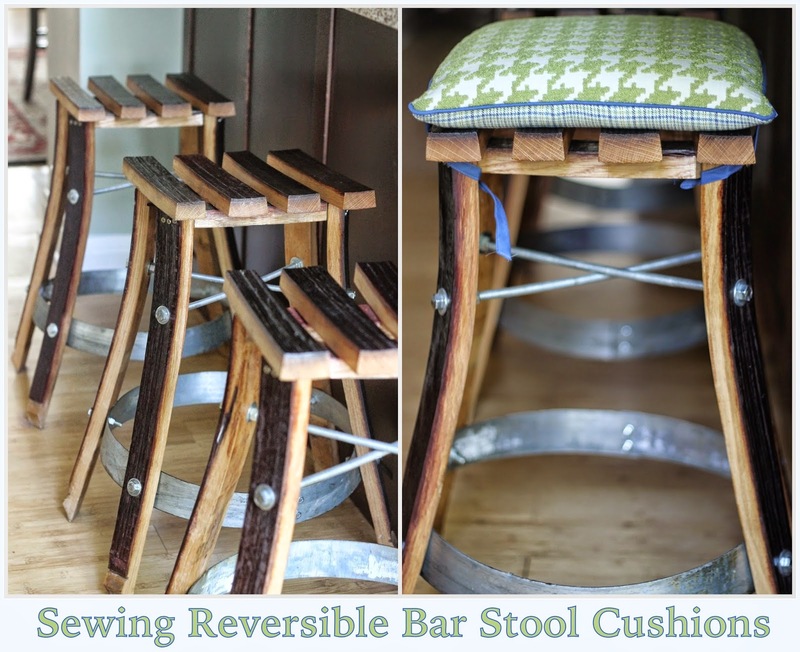 Take your bar stool seat measurement. For me it was 11.5 x 11.5". Make your ties by cutting bias tape to 24" long sections. Sew the edge of the bias tape closed and finish the ends to make long strips. With the right sides together and piping between your fabrics, sew (or serge) around 3 sides of the fabric. Place your zipper in the last side and then finish sewing. The stool seat in the photos below is about 12" x 12". 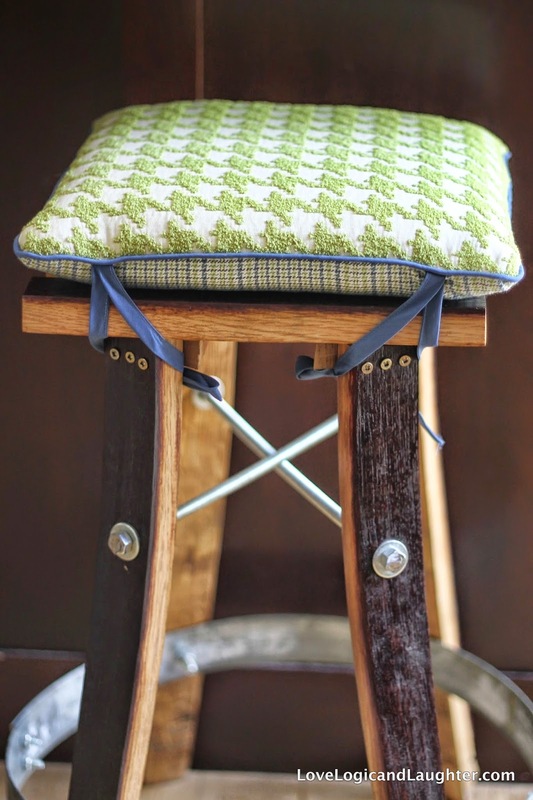 I had this stool in my house and used it as a guide when making the cushions. I cut my 2" foam 1" bigger than my seat (so I cut it to 12.5"). I had to squeeze and squish the foam to get it into the pillow form. I then cut the batting to the same size and slid two sheets of batting between the foam and the fabric on both sides (the top and bottom). Zipper the pillow shut. 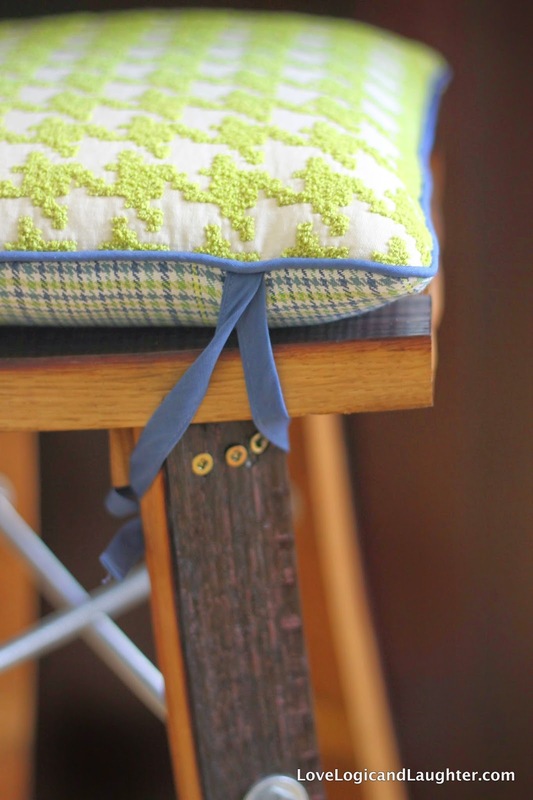 Yes, these cushion covers are technically washable because they have a zipper. And I did serge all the edges on the inside so that you should be able to wash them without any of the stitches unraveling easily... So yes, you can unzip the cover and remove the cushion if you really need to, however I wouldn't say that they are meant to be washed on a weekly basis. 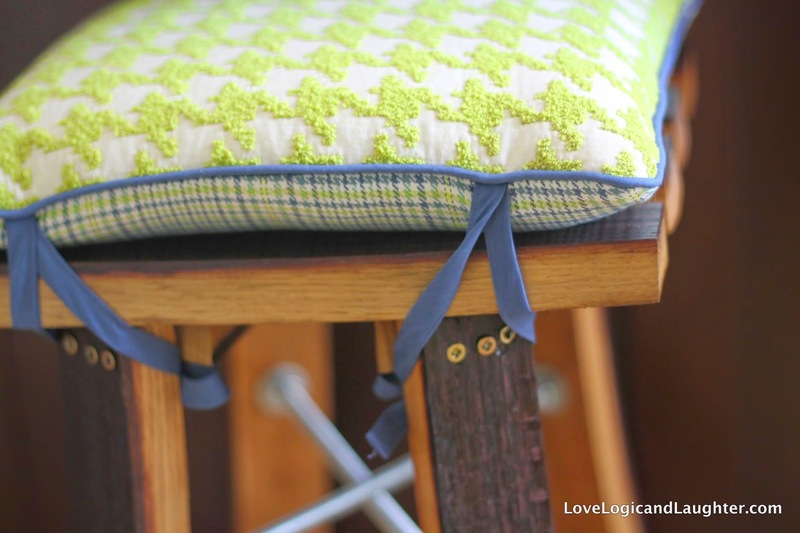 In order to make them extra full for sitting on them, I really stuffed the foam and batting into the cushion cover. It is not the easiest to remove the foam from the cover, but it can be done.